Lisa Thompson is about 4 feet, 7 inches tall, around 116 pounds, and has brown eyes and black hair. Police said she was wearing a black coat, black Nike shoes and pajamas that were pink and gray and had tiger on the shirt. 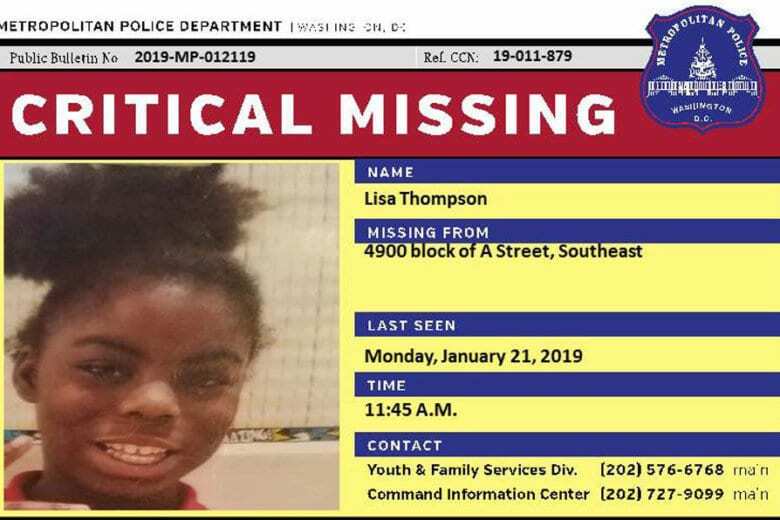 WASHINGTON — D.C. police have located 11-year-old Lisa Thompson, who went missing earlier Monday morning, according to D.C. Chief of Police Peter Newsham. Thompson was located in the 7th District in Southeast D.C., according to police, and appears to be uninjured. Newsham said they suspect Thompson took a bus to Southeast D.C.
Police issued a news release Monday evening asking for the public’s assistance in locating Thompson. Temperatures were expected to be in the single digits in the suburbs and in the low teens in D.C., and police were concerned for the girl’s well-being.